Five of our very talented Year 8 students achieved great success as they recently won the Co-op Design Challenge. In a friendly competition against our sister academies in Leeds and Manchester, the challenge was to put forward two ideas that the Co-op retail shops could feasibly use in the future. The students came up with two ideas (a SEEDS membership card and a recycling unit in each store) which really showed their creativity and innovation, as well as their understanding of the Co-op and how it operates. The actual project started when the students were in Year 7, meaning they have put months of work into the project and perfecting their ideas. 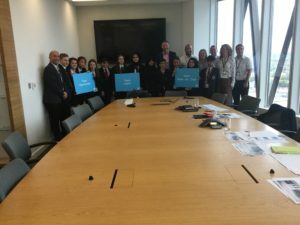 This culminated with the students going to Angel Square in Manchester (The Co-op’s HQ) and presenting in a Dragon’s Den style format. And they definitely wowed the dragon’s, not only with their ideas but with their presentation and confidence. The first idea the students had was very much in keeping with the ethos of the Co-op. This was a recycling station that would encourage customers to recycle their glass; plastic and cardboard. The unit had a basketball hoop that customers shoot their recycling through, making it much more interactive and fun. Touch screens on the unit also detailed the importance of recycling. The second idea (and the idea that won overall) was described by one of the judges as ”the best idea I’ve seen in a long time” and truly showcased the students’ ability. It is a Co-op membership card for young people (10 to 16 years old) called SEEDS. This is an acronym of the Co-op’s core values (Solidarity; Equity; Equality; Democracy; Self-help/Self-responsibility) that, when used by the customer, see’s the Co-op plant a certain amount of drought-resistant seeds in developing countries, to help with crops/food. The more you spend, the more seeds that are planted. Spending over a certain amount (£20) would also see the Co-op give a litre of water to the developing countries in tandem with their current work with The One Foundation – which works in developing countries to give people access to safe, clean water. Format Equipment Manager Steve Gell, who organised the challenge, said: This was the first Co-op Design Academy and it was a pleasure to see the enthusiasm from the students from day one. We kept the development process as close to reality as possible to ensure the students were given the best experience possible along with the assistance of our design partners from Displayplan and Itab. The Dragons along with Myself and my team were impressed with the standard and content in their presentation on the day and they showed they had a full understanding of the What, Why and How behind their ideas. The next stage is to meet with the students over the next couple of weeks to see if we can deploy their ideas into one or more of our stores to test. The students worked incredibly hard on their ideas and presentations, and even presented to the entire staff population at the Academy as a warm-up. 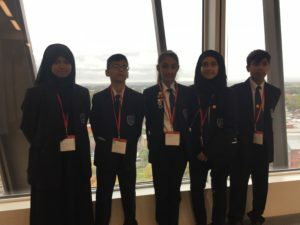 A huge well done to Halimah; Taieba; Missbah; Luqman and Subhan – who have made the Academy incredibly proud of them and the work they have done.